Ghosts and Mysteries, Oh My! Today’s written on the run newsletter is brought to you by the letter ’N’ and the number ’10.’ ’N’ for Nightvale, as in the Welcome To Nightvale novel, which came out this week, and which has already caused a fair amount of squealing, fainting, and otherwise hysterical behavior. And that was just from Mark when he opened the box from our distributor yesterday morning. ’10’ is the number of fingers on the hands that are madly typing this RIGHT NOW. It’s also a day of the month, as well as the average number of times in a given day that we’ve wished there were more hours that could be devoted to reading. Tomorrow night is GHOST NIGHT, our very first adult bookstore hang-out night. 7pm until 9pm—or whenever the last person with cash leaves. We’ll be here, talking about ghosts and spooks and what-not. Folks from V.E.I.L. Paranormal will be on-hand, and we’ll have a special selection of books on sale (ONE NIGHT ONLY! sort of sale). 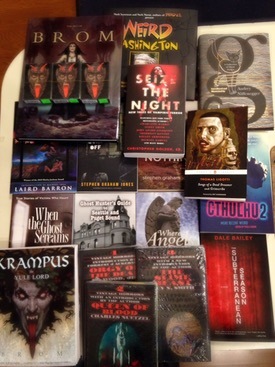 In fact, here’s a quick glimpse of some of those books. Also, we’re delighted to be producing a special chapbook for tomorrow night. It’s a story written especially for Ghost Night by a local author, and, in fact, it’s called “Ghost Night” and concerns the mysterious goings-on in a bookstore. Not this store. There’s nothing mysterious about this store. Except for the marmot. And what’s happening on the 10th. But not next month. Anyway, enough of all that enigmatic hand-wavy stuff. Ghost Night. Tomorrow! New Books. Now! 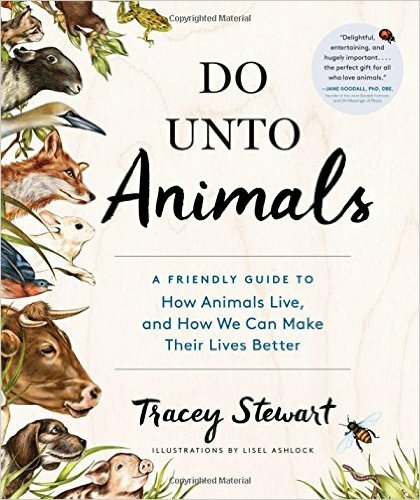 In addition to the delightful weirdness of Welcome to Nightvale, we received copies of Tracey Stewart’s Do Unto Animals: A Friendly Guide to How Animals Live and How We Can Make Their Lives Better. It probably doesn’t include patterns for knitting sweaters for small dogs or hats for cats. Sorry. Nicholas Sparks has a new book called See Me, which is about people falling in love and then one of them dies yada yada yada there will be a movie next month that will have people more gorgeous than any of us, shedding lots of tears about love and loss and so on and so forth. You know the drill. J. K. Rowling is back as Robert Galbraith with Career of Evil, and Kate Morton has given us The Lake House. Not the whole lake house, but a reasonable facsimile of one wherein something historically interesting happens. Also, in the department of books being collections of words that aren’t always strict narrative we’ve received Radiance, Catherynne M. Valente’s new “decopunk pulp SF alt-history space-opera mystery set in a Hollywood—and solar system—very different from our own.” Unlike, say, Marisha Pessl’s Night Film, which is set in a Hollywood (indirectly) and solar system like our own (mostly), but without the decopunk, pulp, SF, and space-opera elements. 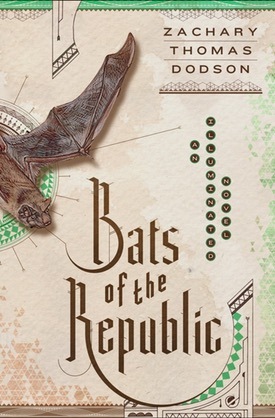 Also, some of us think Zachary Thomas Dodson is a total overachiever, but we can’t help but be impressed that he not only wrote Bats of the Republic, but he also designed and did all the graphic elements of the book. Seriously, the dude makes us all look like Crayon gnawers who continually failed finger painting. And finally, Amie Kaufman and Jay Kristoff’s Illuminae came out this week. There’s a narrative about a couple of kids in here, but there’s also a couple of mega-corporations, an AI with an attitude, and lots of hacked and redacted documents that purport to tell some kind of truth. We’re just not sure which truth it is. It’s kind of like that perpetual feeling that Fox Mulder had throughout the last two seasons of The X-Files. It’s a week of ghosts and mysteries, is what it is. We call this “planting the seed.” Come by on Ghost Night and find out what we’re not talking about. Colby: Boy oh boy oh boy, it's getting cold in the mornings. Aren't I supposed to be gathering nuts or something for winter? Shouldn't I be burying things? Hey, what's this? A shiny key! I should hide this . . .